Stratfordians look even more ridiculous when further proof of Willie Shakspers illiteracy is clear from the simple fact that there are no extant letters in his hand. In contrast, many letters by Edward de Vere’s have survived. And to emphasize his extensive education one is written in French at just age 13. • “hath many good parts in him” (cf. Sonnet 37 “Entitled in thy parts…”) about marrying off his daughter, the subject of several Sonnets. Even some Stratfordians concede these Shakespearean Sonnets are about de Vere’s daughter. My very good Lord, I have perused these letters which, according to your Lordship’s desire, I have returned. I do perceive how both my Lord and Lady do persever, which doth greatly content me for Bridget’s sake, whom always I have wished a good husband such as your Lordship and myself may take comfort by. And as for the articles which I perceive have been moved between your Lordship and them, referring all to your Lordship’s wisdom and good liking I will freely set down mine opinion, according to your Lordship’s desire. My Lord of Pembroke is a man sickly, and therefore it is to be gathered he desireth in his lifetime to see his son bestowed to his liking, to compass which methinks his offers very honourable, his desires very reasonable; again, being a thing agreeable to your Lordship’s fatherly care and love to my daughter, a thing which, for the honour, friendship and liking I have to the match, very agreeable to me, so that all parties desire but the same thing. I know no reason to delay it but, according to their desires, to accomplish it with convenient speed. And I do not doubt but your Lordship and myself shall receive great comfort thereby, for the young gentleman, as I understand, hath been well brought up, fair conditioned, and hath many good parts in him. Thus, to satisfice your Lordship I have, as shortly as I can, set down my opinion to my Lord’s desires; notwithstanding, I refer theirs, and mine own, which is all one with theirs, to your Lordship’s wisdom. I am sorry that I have not an able body which might have served to attend on her Majesty in the place where she is, being especially there whither, without any other occasion than to see your Lordship, I would always willingly go. September 8th, 1597. *To the right honourable, my very good Lord, the Lord Treasurer of England. 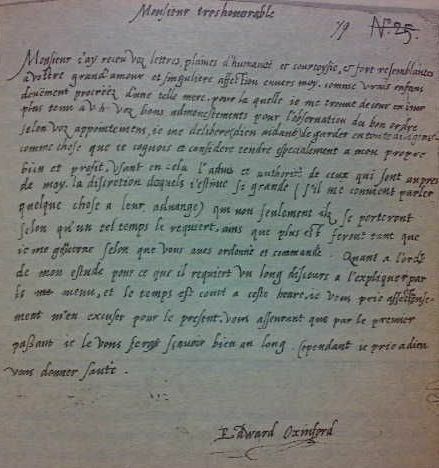 Oxford’s 1563 letter in French to Burghley (William Cecil) when Oxford was just 13 years of age. The literal translation which follows is from William Plumer Fowler’s Shakespeare Revealed in Oxford’s Letters (Portsmouth, New Hampshire: Peter E. Randall, c.1986, pp.1-2). Monsieur i’ay receu voz lettres, plaines d’humanite et courtoysie, & fort resemblantes a vostre grand’amour et singuliere affection enuers moy. comme vrais enfans dueument procreez d’une telle mere. pour la quelle ie me trouue de iour en iour plus tenu a v. h. voz bons admonestements pour l’obseruation du bon ordre selon voz appointemens, ie me delibere (dieu aidant) de garder en toute diligence comme chose que ie cognois et considere tendre especialement a mon propre bien et profit, vsant en cela l’aduis et authorite de ceux qui sont aupres de moy. la discretion desquels i’estime si grande (s’il me conuient parler quelque chose a leur aduange) [sic] qui non seulement ilz se porteront selon qu’un tel temps le requiert, ains que plus est seront tant que ie me gouuerne selon que vous aues ordonne et commande. Quant a l’ordre de mon estude pour ce que il requiert vn long discours a l’expliquer par le menu, et le temps est court a ceste heure, ie vous prie affectueusement m’en excuser pour le present. vous asseurant que par le premier passant ie le vous ferai scauoir bien au long. Cependant ie prie a dieu vous donner sante. Sir, I have received your letters, full of humanity and courtesy, and strongly resembling your great love and singular affection towards me, like true children duly procreated of such a mother, for whom I find myself from day to day more bound to your honor. Your good admonishments for the observance of good order according to your appointed rules I am resolved (God aiding) to keep with all diligence, as a thing that I may know and consider to tend especially to my own good and profit, using therein the advice and authority of those who are near me, whose discretion I esteem so great (if it is convenient to me to say something to their advantage) that not only will they comport themselves according as a given time requires it, but will as well do what is more, as long as I govern myself as you have ordered and commanded. As to the order of my study, because it requires a long discourse to explain it in detail, and the time is short at this hour, I pray you affectionately to excuse me therefrom for the present, assuring you that by the first passer-by I shall make it known to you at full length. In the meantime, I pray to God togive you health. Seeing that it hath pleased your Majesty of your most gracious inclination to justice & right to restore me to be keeper of your game as well in your forest of Waltham, as also in Havering Park, I can do no less in duty and love to your Majesty but employ myself in the execution thereof. And to the end you might the better know in what sort both the forest & the park have been abused, and yet continued, as well in destroying of the deer as in spoiling of your demesne wood by such as have patents & had licences heretofore for felling of timber in the Queen’s time lately deceased, presuming thereby that they may do what they list, I was bold to send unto your Majesty a man skilful, learned & experienced in forest causes, who being a dweller and eye-witness thereof might inform you of the truth. And because your Majesty upon a bare information could not be so well satisfied of every particular as by lawful testimony & examination of credible witness upon oath, according to your Majesty’s appointment by commission a course hath been taken in which your Majesty shall be fully satisficed of truth. This commission, together with the depositions of the witness, I do send to your Majesty by this bearer, who briefly can inform you of the whole contence. 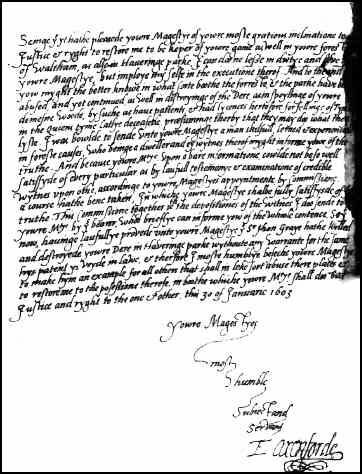 So that now, having lawfully proved unto your Majesty that Sir John Gray hath killed and destroyed your deer in Havering Park without any warrant for the same, his patent is void in law, & therefore I most humbly beseech your Majesty to make him an example for all others that shall in like sort abuse their places, & to restore me to the possession thereof, in both which your Majesty shall do but justice and right to the one & other. This 30 of January 1603. Your Majesty’s most humble subject and servant.